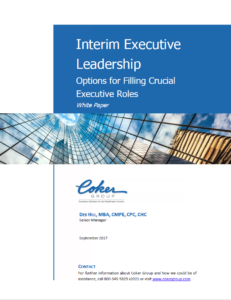 Immediate replacement versus interim management is a consideration for every executive team that must fill a vacancy in its high-level leadership positions. Management turnovers, especially at the C-Suite level, are prevalent in the healthcare industry. Realistically, the recruitment and hiring of replacements for departing healthcare leaders often take considerable time to accomplish even with the engagement of a search firm, leaving an organization vulnerable during the time the position is vacant. A growing trend in the healthcare management market is to fill these vacancies with an interim solution instead of seeking an immediate full-time and permanent replacement. This paper presents advantages and disadvantages for both immediate replacement and interim management. The purpose is to assist you in your approach to executive staff replacement and to offer the pros and cons of provisional management models. Careful consideration of the advantages and disadvantages should provide some valuable insight into determining which process will work best for the organization.